One of the first things that a person notices when they arrive in Nanjing, is that unlike other Chinese cities, many of the main streets are lined with mature trees. 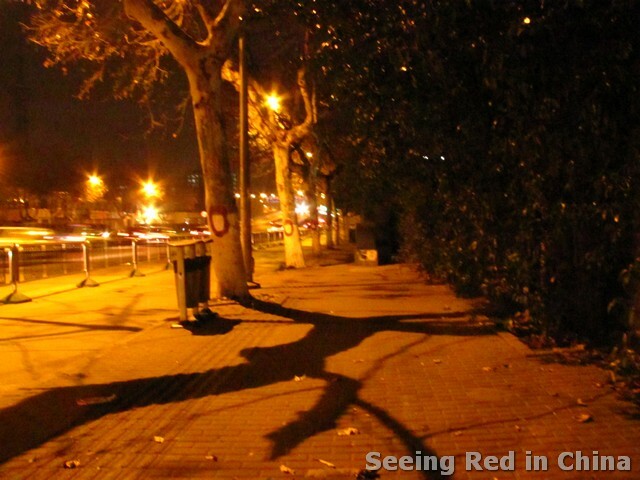 Some of these trees were planted over 60 years ago, and in some ways are the symbol of Nanjing. But now with the Youth Olympic Games just two years away, the gov’t is feeling the need to modernize (or has an excuse to push through troublesome projects). The first big step is to make sweeping changes to the infrastructure of the city. This past weekend a viaduct was demolished to make way for a future tunnel, that will supposedly be able to handle traffic better (To my knowledge, no study has been done comparing the cost of enforcing traffic laws to building bigger roads which accommodate crazy drivers). Three more viaducts will be demolished in the near future as well. As one man said to reporters from China Daily, the viaducts only served 16 of their potential 30 years and added, “It’s a huge waste of resources, and I feel sorry for the viaduct.” The report also points to gov’t subsidies promoting car ownership as a possible cause of the current traffic. Then last night as I was on my way home, I saw the trees coming down. Normally, when I talk with cabbies, I solicit their opinions first and try to hide my own, but I didn’t manage that last night. “Why are they doing this?” I asked the driver. “To make space for a bigger road,” he said. I got out and took a few pictures, and as I did I noticed a number of other locals shaking their heads as they walked past the scene. Some stopped to question whether or not it was really necessary, but it was clearly already too late to petition. Totally more than 50 trees were marked for removal. While it did seem that some of the trees were being prepared for relocation, the last time the gov’t took such actions roughly 1/3 of the relocated trees died in the process. At the moment, most protests in China are related to land grabs and health concerns, but it looks like the near future will bring an increasing number of protests related to quality of life issues like the shade of old trees and the other intangible benefits of living in an ancient place. By T in Economy & Development, Environment, Uncategorized on March 22, 2012 . He was taken in for “tea” with the cops afterwards. I saw some of the relocation happening. They cut out the roots. 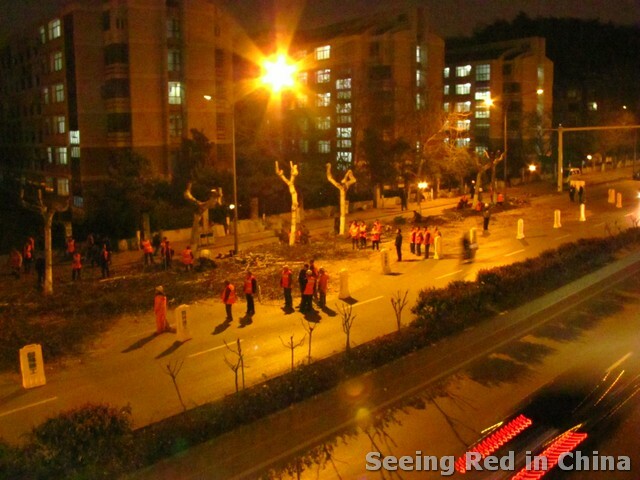 I was walking down Qingdao Lu and saw big trucks carrying trees for replanting, but it was a total farce, because they were cut above ground-level. Almost as good as the foundation on the Beijing-Xi’an high-speed rail. As your pictures show, this was all done at night. I was walking home from the bar at 2 AM when I saw this. 15 MORE subway lines? What the hell? I don’t think the two are mutually exclusive. Agreed tom, but just wanted to point there are sometimes other social factors which reason working at night besides espionage and deception. What a waste. Surely they could have either moved the planned metro lines a bit or spent more money on excavating the tunnels while preserving the trees (and as they’ve shown by their demolition of the viaducts, money is not an issue).